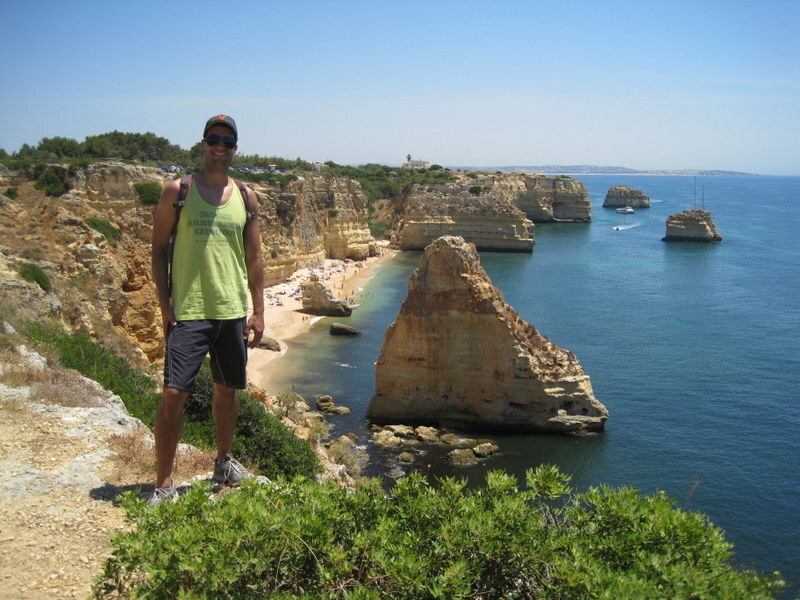 We just got back from a two-week adventure in Portugal with two very special guest-stars Nathan Bryant and Katie Greenhaw. After two fun days exploring Spain, we flew out of Madrid to Lisbon. With the two-hour delay, in which we took down a few beers and played some riveting rounds of Pass the Pigs, we found ourselves at the car rental agency, a German company called Sixt (pronounced “Seext”), around 9pm. 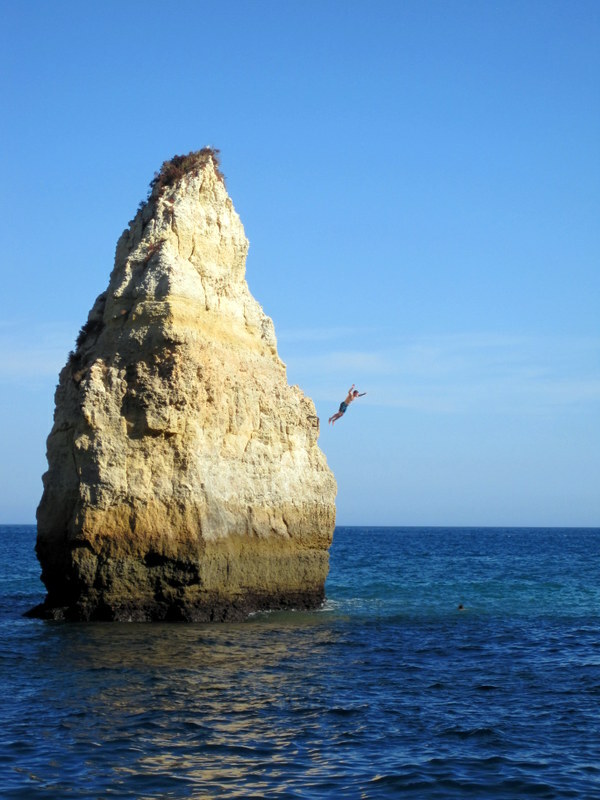 The plan was to immediately drive to the southern coast of Portugal. It didn’t take long for hilarity to ensue. The rental car guy way extremely nice, as is nearly every person in Portugal (more on that later), but he gave us totally convoluted directions to the freeway. We drove up and down the nighttime streets of Lisbon, looking for a BP station that was the critical landmark to get us on the freeway. After a while of searching, we finally found one and pulled in to try to ask for directions and/or buy a map. Nobody spoke any English and we felt the powerlessness you exerience when you can’t speak a local language at all. After a bunch of useless pointing and gesticulating, we realized we weren’t going to get anywhere with the BP attendants. Feeling dejected, just as we were turning around to get back in the car, the rental car guy miraculously showed up out of nowhere on his way to buy a pack of cigarettes. “Nope!” he said cheerfully as he wagged his index finger at us. “This is definitely not the right station! But you can follow my car and I’ll take you to the freeway.” After cheering our rescuer we breathlessly asked him how he had found us at the incorrect station. Without missing a beat he said: “Well, I just used my…Sixt Sense.” Ha! Amazing joke. We spent the next hour on the dark and deserted highway (see Footnote 1, below) trying to figure out if this guy was just that clever, or if he had used that same line before on other hapless Sixt customers. After a three hour drive to the southern coast, where we fell in love with the Portuguese 80’s-only radio station, M80 (“eme oi-TEN-ta!”), which was a staple for every single drive for the rest of the trip, we managed to make it to our guesthouse, O Castelo, by midnight without use the use of a map of any kind (see Footnote 2). It only took about three near-midnight phone calls to the lovely proprietors to figure out the way. Unfortunately, because of our two-hour flight delay, we arrived at midnight and one of the owners had to drive over to let us in. He was really nice about the whole thing, but when we checked out the last day he kept repeating, “You see, the thing is, we don’t do late check-in. We don’t have any extra staff, so we don’t do late check in. We can’t check people in after 10pm.” Thanks, we got it! So, he still managed to rub our faces in it pretty well. 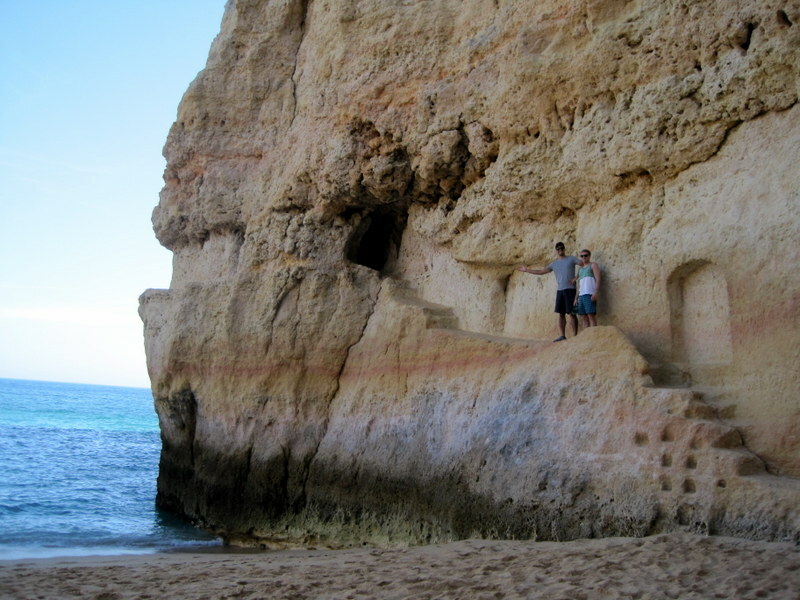 Nathan’s plan for exploring Portugal was brilliant and well-executed (the caveats to that are explained at footnote 2). For a glorious week, we stayed on the Southern Coast and moved from one quaint beach town to the next every two days. The city where we started, Cavoeiero, was extremely small and lovely and actually turned out to be one of the biggest and most populated towns in which we stayed. 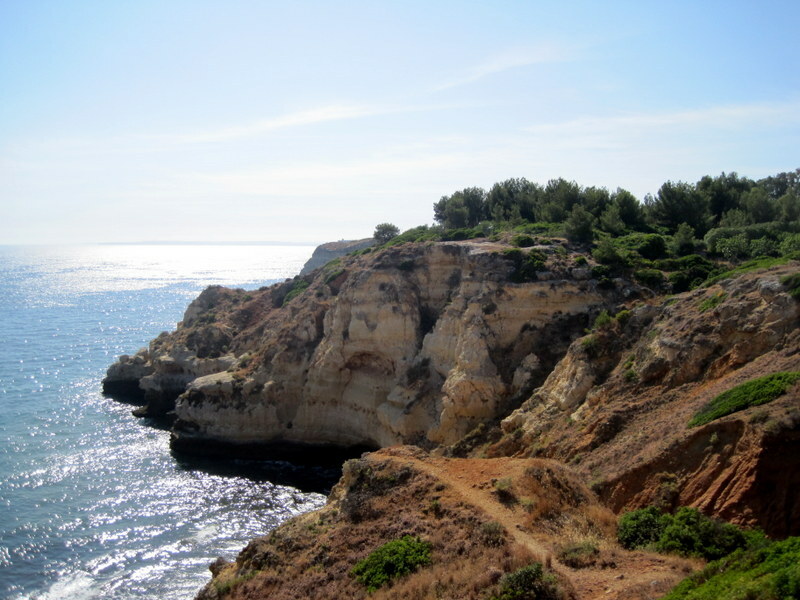 When we woke up the next day at O Castelo (The Castle), we realized what a treat we were in for. 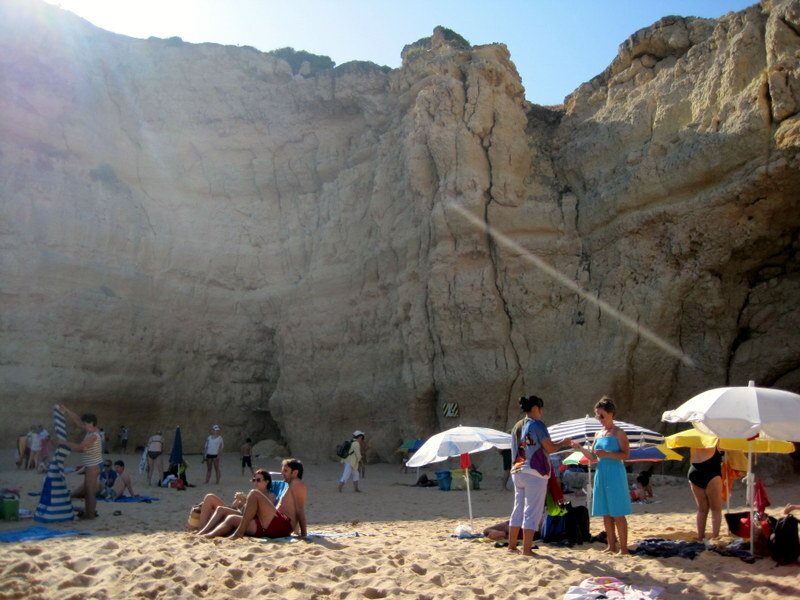 The day, typical of every day in the Algarve region of Portugal, was perfect. 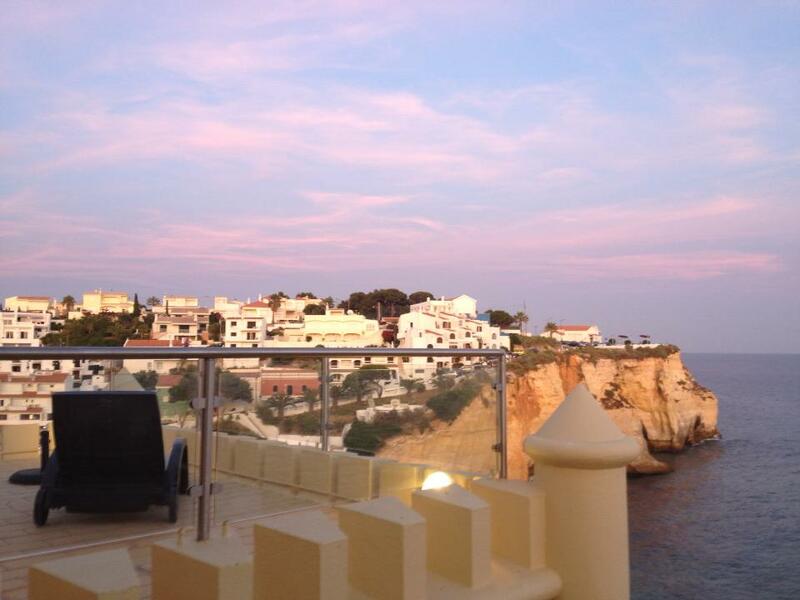 From our cliff-top hotel terrace, we had a stunning view of the bright blue Atlantic ocean, with a cloudless sky and friendly, 78-degree Fahrenheit sunshine. The entire town is structured around its beach, with cliff-side hotels and restaurants perched on the two hills that rise up on either side of the white-sand beach. 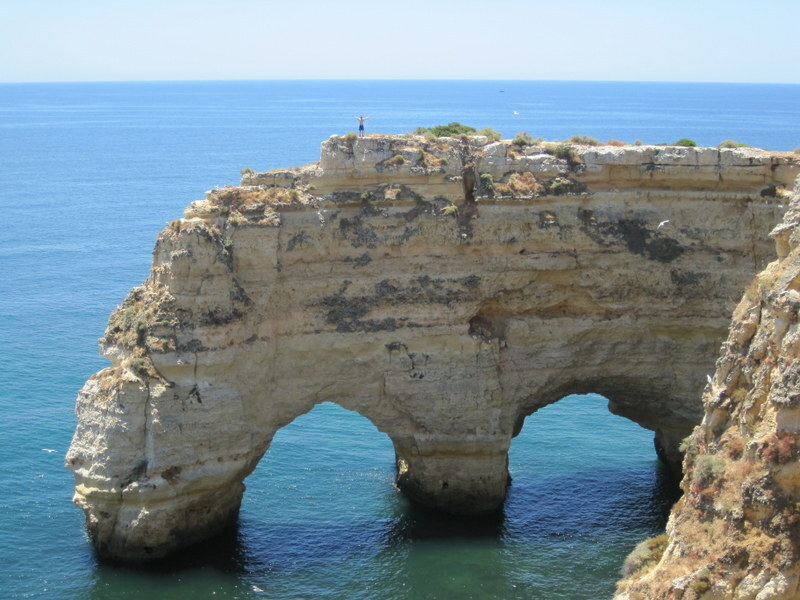 The entire Algarve coast is made of yellowish-whiteish-brownish-redish (depending on the layer) limestone cliffs which carry the signs of thousands and thousands of years worth of erosion and which are chock-full of cool fossils. 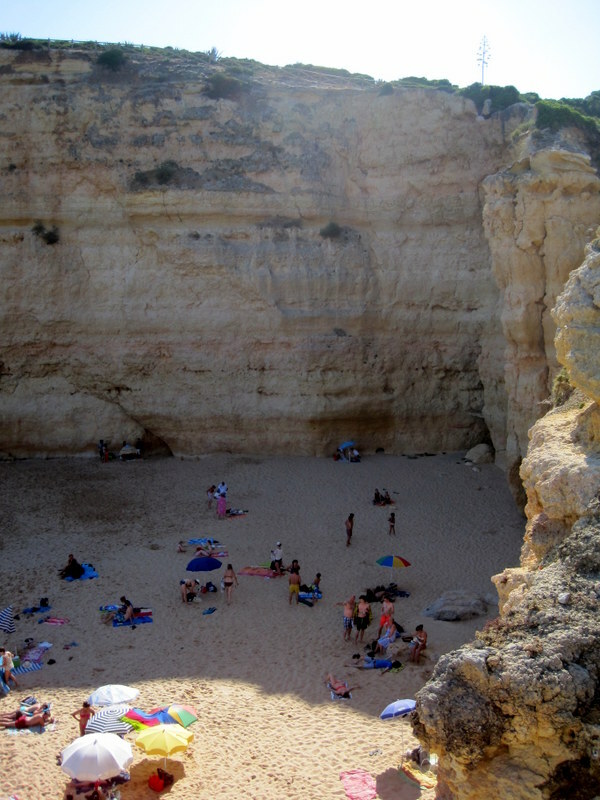 This means that the cliffs and beaches are punctuated with awesome caves. Speaking of getting high up on things, after lunch we drove to a nearby beach which featured a giant sea stack a few hundred feet off the picture-perfect beach. A sea stack is a land formation that juts abruptly out of the water and this one looked that a huge dragon’s tooth. Nathan and I swam over to it and, in true Nathan form, he started to see if he could climb it. Bear in mind, this thing was probably 100-150 feet high. Well, amazingly, he made it about halfway up before deciding that it was time to go down. The only way down way to jump. After I did some “research” to confirm that it was safe, Nathan lept out into the abyss and splashed safely in the water next to me to the delight of the observers from the beach. Laura took a simply fantastic picture which captures the moment better than my words can. See for yourself. Impressive, right? 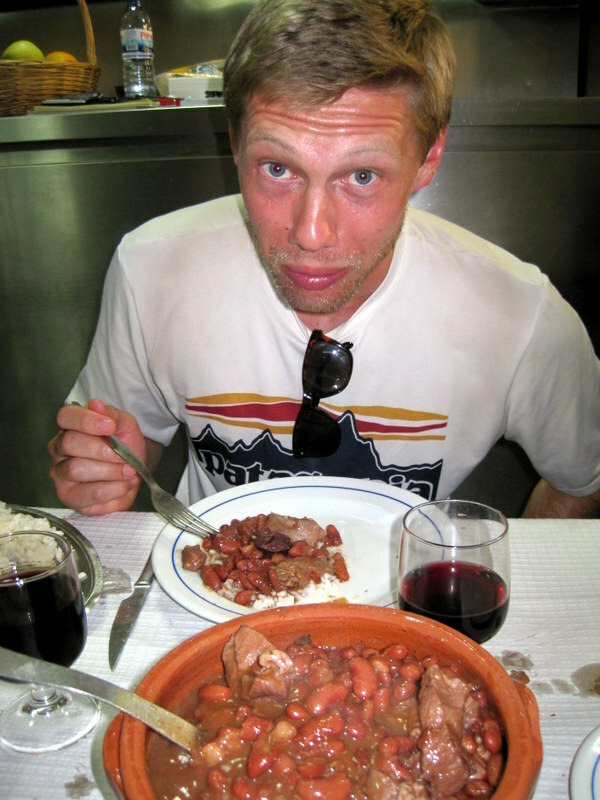 For the foodies out there, you should know that the food in Portugal is fantastic. That night we went to a recommended local spot and tried our first authentic Portuguese dish called “cataplana” which is a top of circular copper pot in which different types of seafood are cooked. This particular cataplana included fresh prawns, hake, tomatoes, potatoes, onion, cayenne pepper, and cilantro. The Portuguese know what they are doing with the spices, let me tell you. The next day we drove to a nearby beach and started a hike to one of the world’s top 10 beaches according to the Internet. 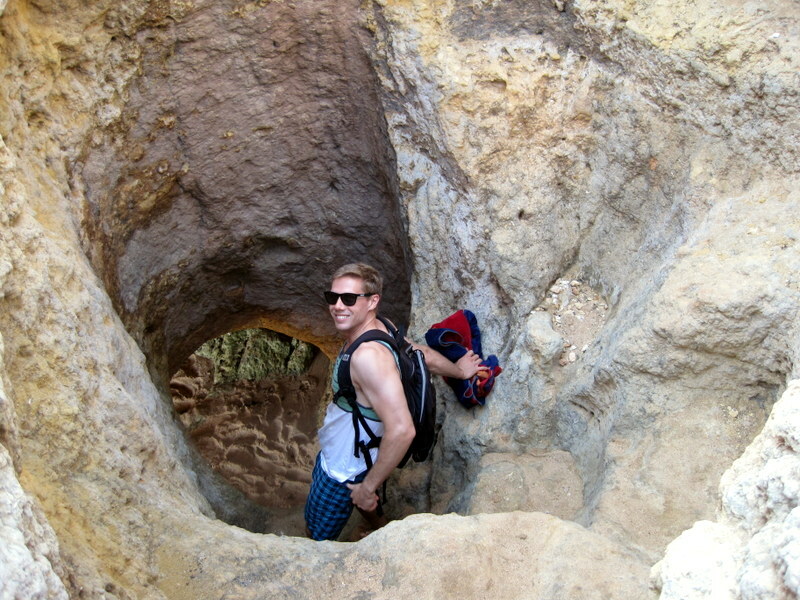 The hike wound along the cliffs the entire way and we passed by huge sink-holes created gradually over time by erosion. Looking down through the huge holes in the ground, you can see underground beaches where the ocean waves lap the bottom of the hole. After we made it to the famous beach, which had a stunning double-arch cliff formation that is probably unique in the world, Nathan and I immediately jumped in the water and swam out through the double arch and around the corner to explore the sink-hole caves we had passed on the hike. Sure enough, the caves were big enough to swim into safely and after brief darkness and freezing cold water, we found ourselves standing on an underground beach lit up only from the hole in the earth above our heads. 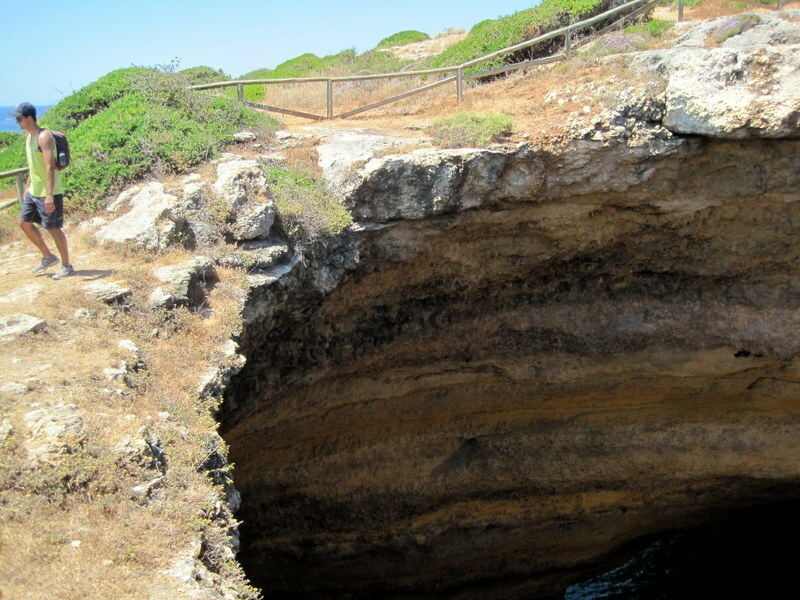 You could easily imagine the caves being used by smugglers during the pirate heyday, and that’s exactly what these cave networks were used for. I’ve never seen anything quite like it anywhere else in the world. 1. The highway system in Portugal is owned by a private company so you have to pay a fairly high toll to use the roads and the result is immaculate roads that are utterly deserted, even during the day. 2. This is a good opportunity to demonstrate the idiosyncratic brilliance of the mind and thought process of our great friend and travel companion, Nathan Bryant. Let me preface this by saying that Laura and I were pretty busy with our move to Spain and immediate trip to Ireland, so we left virtually all of the planning up to Nathan, a project which he graciously took on and for which we are eternally grateful. That being said, the day after we arrived in Carvoiero, our first beach town, Nathan asked us if we had seen “the trip files” yet. Given our complete lack of directions to our first destination, I had assumed that Nathan just booked some good-looking lodgings and then left the rest up to fate. Not so. The “trip files” were contained in a manilla envelope and included hand-written comments printed on Google Earth Satalite Images of the coast-line of each area we would be staying. 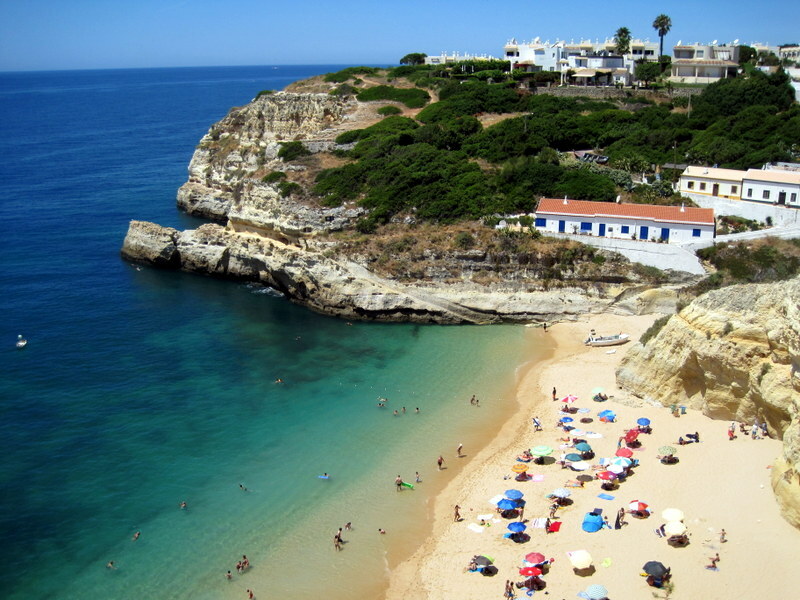 The notes labeled promising beaches and included comments like “What is this beach? Possibly deserted?” There was also a printed record of every e-mail exchange that occurred between Nathan and the various lodging owners. However, nowhere in this mountain of wonderful data was anything resembling a map or directions from one town to the next. It reminded me of the movie “A Beautiful Mind,” only minus the psychotic breakdowns. The ongoing joke of the trip is that Nathan is a “results oriented” travel partner. Regardless of how got it got done (drive the car into a ditch…no problem! ), we always ultimately ended up where we needed to be. The end result is a traveling experience that feels both heavily researched and yet entirely spontaneous and organic. “Who needs a map?” Seriously though Nathan, we love traveling with you and we learned that you really don’t need a map – just a set of 10 hand-annotated satellite-image slides and sub-slides.